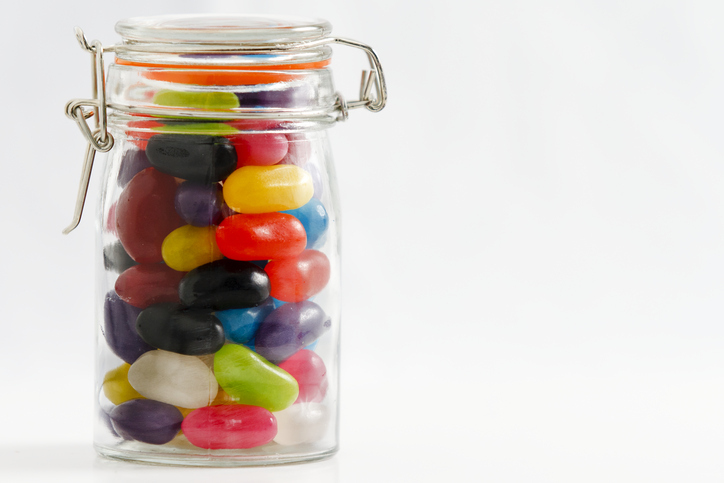 There are roughly sixty jelly beans in the jar. Roughly is an adverb with two different meanings. It means ‘almost’ or ‘approximately’ and it also means ‘in a violent manner’ or ‘without precision.’ You may remember this second meaning from the adjective rough. It will take roughly three hours to get there. The bully pushed his victim roughly and demanded his pocket money. The kid colored his drawing roughly inside the lines. Roughly and approximately mean the same thing, but approximately is more formal. More or less is less formal and is very common. Nearly is also used to mean something similar to roughly, except that nearly always means ‘almost.’ For example, if we had 47 people at a party, we could say there were roughly 50 people or we could say there were nearly 50 people, but if we had 52 people at the party, we could only say there were roughly 50 people, since 52 is more than 50. Roughly comes from the adjective rough, which dates back to before 1000 and comes from the Old English word rūh. It is similar to Dutch word ruig and the German word rauh. It was first used as an adjective around the year 1300, but it only became a synonym of approximately in the mid-19th century.